Home » Uncategorised » Shock-horror at MOD’s DEP overspend – but is this actually “news” ? Shock-horror at MOD’s DEP overspend – but is this actually “news” ? Although no official figure has been published that TMT is aware of, the new Ajax vehicle is reputed to come in at 12 million a pop. Can the UK continue to afford such expensive kit – and, if not, then who is going to “call time” on such projects? Papers this morning are reporting that the NAO (National Audit Office) has identified a huge shortfall in the Defence budget for the 10-year Defence Equipment Plan (DEP), for the period 2018 – 2028. Some figures being touted talk of a £7bn gap – others up to £14bn. Regardless of the actual amount, all reports mention that the NAO reckons that planned equipment purchases are simply unaffordable. “The Department’s Equipment Plan is not affordable. At present, the affordability gap ranges from a minimum of £4.9bn to £20.8bn if financial risks materialise and ambitious savings are not achieved.” Sir Amyas Morse, head of the National Audit Office, 31 January 2018 on the 21017-27 DEP. Another cash guzzling programme – the Boxer 8×8. A minister is seen looking very pleased to announce approvals to go ahead with the programme. Will he be quite so happy about what he did to our finances in a few years’ time? Part of the problem was that the rate of “defence equipment inflation” had risen from under 1.5% in 2012/13 to over 7% by 2016. In addition, the Strategic Defence and Security Review of 2015 had added some £25bn to the MOD’s bill. The main ticket items here were the F-35 aircraft, the Poseidon maritime patrol aircraft, and the new Mechanised Infantry Vehicle being pushed by Gen Nick Carter (the current CDS). However, the most worrying aspect of this increase was the amount of sheer bad planning that was exposed by the NAO. Lack of allowance for currency fluctuations, for example: given that the UK MOD was on the hook for $28bn of overseas equipment purchases, this was not to be sneezed at. Or the apparent £4.8bn underestimation by MOD project teams of the financial risks of bringing new equipment on stream. Two major projects were identified as examples of where the MOD had simply failed to plan effectively in terms of long-term acquisition costs: the Type 26 heavy frigate (or Global Combat Ship) and the nuclear-sub programme. Many of us like the idea of being a carrier-wielding power again. It has many advantages in terms of world diplomacy and politicking – but will we have to manpower and money to actually deploy these tow massive vessels in a meaningful and convincing manner? It would be misleading to suggest that things had gone wrong “overnight”; they had not. However, as the NAO started to get to grips with the complexities of the MOD’s spending and financial control systems, it was able to shine lights in places that had previously remained dark and relatively unexplored. To be fair promises made in 2012 were, in some cases, being fulfilled: the spending reviews between 2010/13 looking at large projects had concluded that some £4bn could be saved over 10 years, and by and large the MOD was on its way to achieving that aim (£3.4bn saved). That said, take a look at the MOD’s Defence Equipment Plan for 2017. You will see that Section B is called “Improvements in MOD Processes and Functions”. This starts off in a confident manner, talking about the implementation of strategies and processes designed to save money and time. Indeed, some examples of actual savings are given. But as you read on down you start to get the impression that more and more agencies, reporting structures, control processes and acronyms are involved making it almost impossible to follow what is being said (and bear in mind this is intended to be a report to the British public on how their tax-pounds are being spent!). 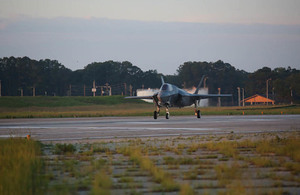 A “proud moment” according to some, when the first F-35 landed in the UK earlier this year. Will, we actually are able to afford the totals ordered, or will we. like a number of other countries, have to face realities and reduce throwing money that we can ill afford at this staggeringly expensive aircraft. It leaves one wondering whether there is, in fact, any single person in the MOD who truly understands, and who has a grip on what is going on. For without that sort of clear leadership, people will come and go, keeping things ticking over till their time is done and they are promoted from buying boots and socks in the MOD to sorting employment regulations in the DWP. Almost as an afterthought, the 2017 DEP report adds: “The Modernising Defence Programme will also aim to improve performance on commercial and industrial issues.” That is an interesting comment as one of the main reasons the MOD asked to set up the MDP was that they refused to adopt a “Fiscally Neutral” approach to future spending being applied to the overall UK defence strategy being overseen by the Cabinet. That is to say, they wanted to be free to plan to spend more if they thought it necessary. And so, back to today’s headlines. It may be seen from earlier TMT articles (What is “Modernising Defence Programme” & why do we have it? published on 2nd July this year), that they do not really tell us anything we did not already know. Indeed, if you look at the NAO’s worst-case warnings in the 2017 report, you will note that they talk about a possible £20.8bn gap in the budget over the next ten years. That is perhaps why they politely say the MOD’s current admission that the gap might rise to £15bn “could still be optimistic”. So what can we do to stop this continual overspend? The answer is not going to be simple. But it will involve a combination of hard decisions on near-term spending (given that the NAO says this is when much of the currently-identified overspend will take place) and straightforward cuts to future plans to stay within budget over the longer term. Given that money does not grow on trees, there is simply no other choice (unless someone, somewhere in the MOD is hoping to make a financial hostage of the Government by signing contracts that the UK cannot then get out of). For example, why are we spending billions on a new infantry vehicle when a conversion of the Mastiffs to an 8-wheel layout might achieve much of what the 40+ tonne Boxer will do – and yet for a fraction of the price and weight. Why are we persisting in allocating so much of the Navy’s resources to the operation of just two ships? How can we continue to justify the acquisition of the horrendously expensive F-35 aircraft when even the US is suffering serious indigestion over its price? In fact, in a world where the majority of European countries spend very much less on defence than the 2% agreed at the 2014 Wales conference, why are we not doing the same in the UK? Is it not preferable to do less – but do it properly, instead of talking about wonderfully sophisticated weapons and equipment that we can never really afford to maintain or operate? It is a hard call – and especially at a time when the UK is leaving Europe and looking at re-establishing old connections and alliances in the larger world. For there are many cultures out there that place much value upon military strength and a willingness to use it. For the UK to step back and try to do a “Germany” would be to ignore the lessons being learned by even the most centrist politicians of that country; you have to be strong to be influential. However, taking another leaf out of Germany’s book, perhaps there is a way we can afford the defence we seem to think we need. If we, as a country, face up to the fact that, post-Europe, we will sink or swim based upon our productivity and efficiency, and if we then just got on with the business of working hard and creating revenue, then we might well have the funds to deliver the necessary equipment to our Forces so that we can continue to call ourselves a “World-power”. So who, Dear Readers. is going to step up to the mark and tell the Four-Stars that the piggy bank is now empty? The likes of Mr. Williamson? Thoughts and comments in an email to TMT please! Images Crown copyright: UK MOD. Quotes from various UK Government public domain publications. Comments on Shock-horror at MOD’s DEP overspend – but is this actually “news” ?